Over the years, different data assimilation methods have been implemented to acquire improved estimations of model parameters by adjusting the uncertain parameter values in such a way that the mathematical model approximates the observed data as closely and consistently as possible. However, most of these methods are developed on the assumption of Gaussianity, e.g. Ensemble Kalman Filters, which is not the case in practical situations, and hence they result in poor estimations. In this work, the estimations of uncertain parameters are acquired from an Ensemble Square Root Kalman Filter and from a novel method, an Ensemble Transform Particle Filter, that does not have an assumption of Gaussianity. The latter method is developed on the backbone of Bayesian approach of sequential Monte Carlo with the framework of linear transport problem and has proved to be highly beneficial for systems with non-Gaussian distributions. We examine the performance of these methods in a twin experiment setup, when the observations of pressure are synthetically created based on the assumed true values of the uncertain parameters and implementing the Darcy flow model as the forward model, which is used for the data assimilation algorithm as well. We consider two test cases based on different geometrical configurations and distributions of permeability field across the domain representing low and high dimensional systems with small and large number of uncertain parameters, respectively. The numerical experiments demonstrate that Ensemble Transform Particle Filter provides comparable results with that of Ensemble Square Root Kalman Filter for the low dimensional system and outperforms it for the high dimensional system. Ruchi, S, & Dubinkina, S. (2018). 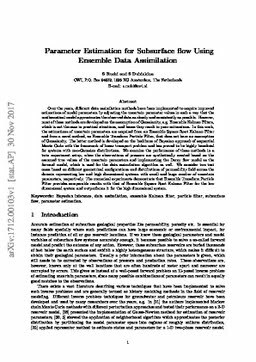 Parameter estimation for subsurface flow using ensemble data assimilation.